Last year, just a few months into this divisive presidency, Pillsbury House Theatre presented a series of short plays commissioned from local playwrights titled The Great Divide: Plays for a Broken Nation. Utilizing art not to judge or blame, but to explore where we are at this present moment, how we got here, and how we can move forward. One year later, it feels like we're more divisive than ever (although not without a few glimmers of hope), and Pillsbury House has yet again commissioned five short plays, this time under the title The Great Divide II: Plays on the Politics of Truth. They asked the playwrights, "What does truth have to do with our us vs. them mentalities? What is the difference between fact and truth anyway, and does it matter? What happens when our firmly embedded emotions become facts?" The result is five very different and very thoughtful plays, all dealing in some (more or less obvious) way with truth. Last year's incredible four-person cast (Audrey Park, Mikell Sapp, Ricardo Vázquez, and Tracey Maloney) returns, each of them so versatile as they create very different characters in these very different stories in a short amount of time. DJ Chamun also returns to keep us entertained before the show and between each play, with an interesting selection of songs. New this year is director Noël Raymond, clearly leading us through each story and finding a connection between them. All stories play out on a nearly bare stage, with that fractured red and blue map of the country on the floor. 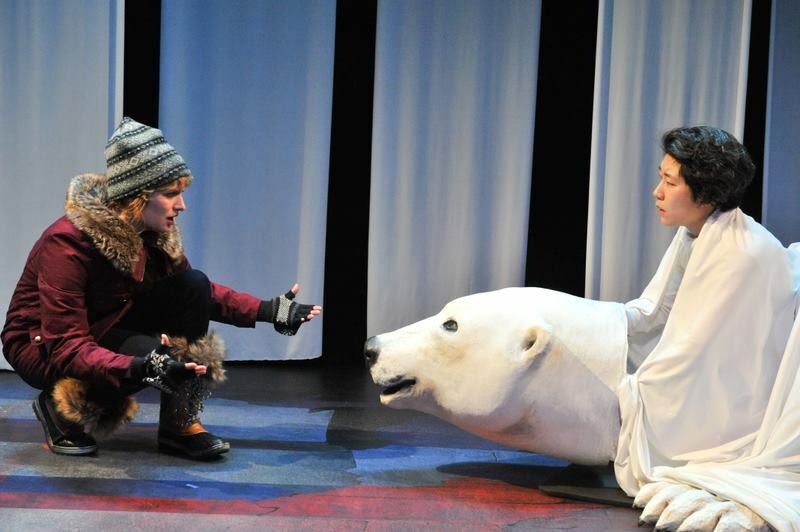 Minimal set pieces and costume changes place us in new worlds in a matter of minutes, with a little help from the imagination (environmental design by Kellie Larson, costume design by Amber Brown). Just what the title says, but somehow way more interesting. Through these (actual) emails we hear how the playwright's enthusiasm for journalism slowly faded as she dealt with the practicalities of working in journalism in today's world. A fantastical story about a creature who lives in the woods, told from various perspectives so that we're not quite sure what's real and what's not. Two couples travel to Mt. Rushmore, some reluctantly, some enthusiastically, and some hard truths come out, both personal and political. A woman who is out hiking (and maybe hunting) in the woods in Minnesota discovers a dying polar bear, with whom she has a conversation about life, love, and loss. 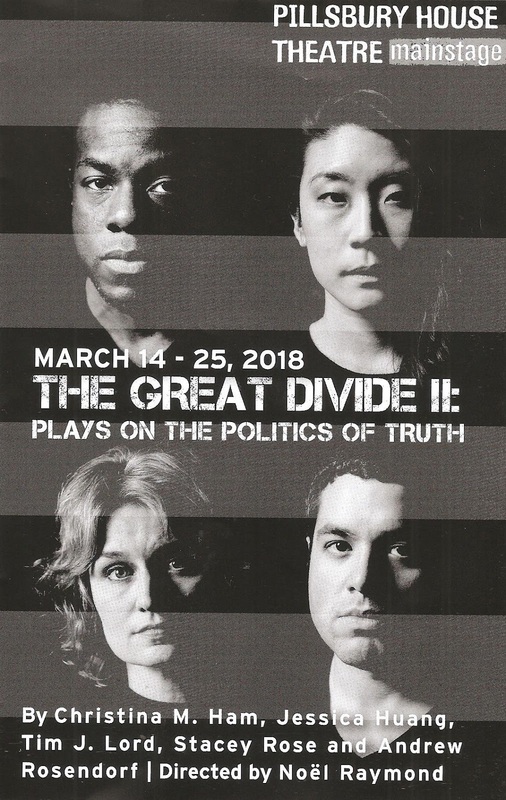 The Great Divide II plays for two short weeks only (through March 25). There's no bashing of anyone; these are plays that anyone and everyone could and should see as a catalyst for thought and conversation about these very timely issues. I hope that Pillsbury House continues this series until this great divide is healed, because responding immediately to what is happening right now is one of the most valuable services theaters can offer to the world.